Once all data are in, energy-related carbon dioxide (CO2) emissions in 2013 are expected to be roughly 2% above the 2012 level, largely because of a small increase in coal consumption in the electric power sector. 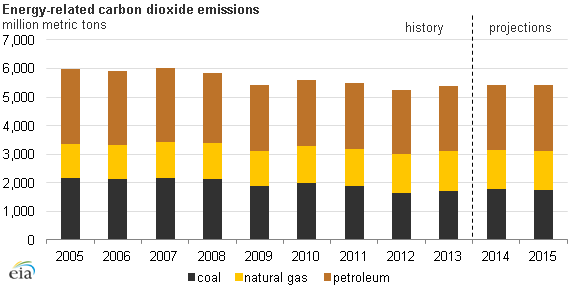 Coal has regained some market share from natural gas since a low in April 2012; however the impact on overall emissions trends remains fairly small. Emissions in 2013 are slightly more than 10% below 2005 levels, a significant contribution towards the goal of a 17% reduction in emissions from the 2005 level by 2020 that was adopted by the current Administration. 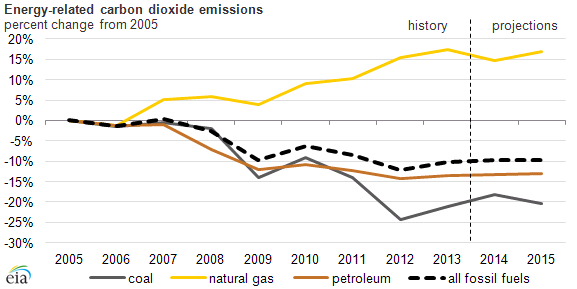 This level of reduction is expected to continue through 2015, according to EIA's most recent Short-Term Energy Outlook.